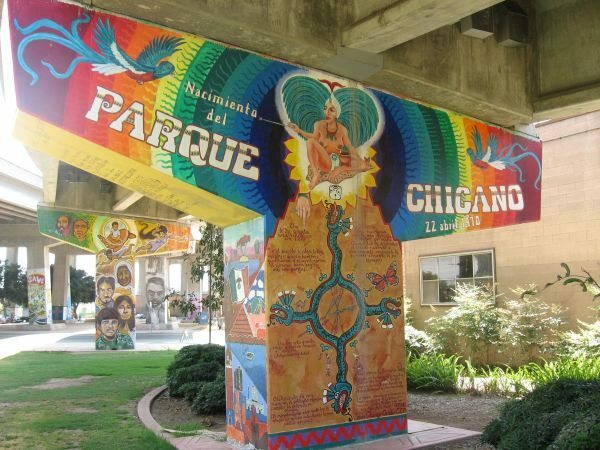 On January 11, 2017, Chicano Park was recognized as a National Historic Landmark. Native San Diegans and art historians are probably unaware of the hidden history behind San Diego’s Chicano Park murals. These murals appear to be linked to Mexico’s rich history and to legendary muralist David Alfaro Siqueiros, who inspired Gilberto Ramirez, and Guillermo “Yermo” Aranda, artist and chairman of Toltecas en Aztlán – a local Chicana/o artists’ collective group who also initiated the murals at Chicano Park. San Diego’s Chicana/o murals did not simply materialize; a timeline suggests they appeared through a series of events. “It was turbulent in the late 1960s and early 1970s with protests of the Vietnam War and for human rights” recalls Jim Brega, San Diego State University (SDSU) alumnus. Expressive art protests led to Chicana/o murals appearing both locally and afar. Mexico’s muralist, Gilberto Ramirez, seems to be a crucial missing link and a monumental unsung hero of San Diego’s Chicano Park murals. In Mexico, Ramirez was an apprentice to the legendary Mexican muralist Siqueiros (1896-1974.) Siqueiros is recognized as one of “Los Tres Grandes,” one of the three great muralists of Mexico, along with Diego Rivera and Jose Clemente Orozco. “During the fall of 1969, Ramirez came to San Diego to see what was happening in the local Chicano Movement,” recalls Guillermo “Yermo” Aranda, a San Diego native. Aranda, and Ruben DeAnda were both students – Aranda at SDSU and DeAnda at a community college – who assisted Ramirez in producing a large, canvas, three-piece mural located inside the Aztec (student) Center at SDSU. This mural was originally named Amanacer, dawn. Each panel is about 20’ H and 12’ W. Throughout the process of painting Amanacer, Ramirez taught Aranda and De Anda techniques and processes for initiating, working on and completing large scale murals. Initially, monies were needed in production and supplies for the mural. Aranda assisted Ramirez in securing funds from SDSU. While working on Amanacer, “Ramirez constantly talked about Mexico City, urging us (his assistants) to go see the murals done by Siqueiros, Rivera, and Orozco,” states Aranda. Amanacer was started in the fall of 1969, and completed in January 1970. On December 7, 1970 the San Diego Union newspaper published “S.D. State Unveils Mural to Honor Chicano Crusade” announcing the SDSU mural. In 2009, Jim Brega donated Ramirez’s original drawings for Amanacer (Today it is called “Triptico,” refers to triptych) back to SDSU. On March 7, 2014, John Gibbins with U-T San Diego newspaper recognized the rededication for mural “Triptico,” located inside SDSU’s new Conrad Prebys Aztec Student Union. After Amanacer’s completion, Aranda went to Mexico City to see what Ramirez had described. The murals by Siqueiros captivated his attention with their “perspective” and “foreshortening” – spatial illusionary techniques creating three-dimensional depth and volume. Aranda’s La Dualidad reveals influences of both Ramirez and Siqueiros, it contains three sections just as Ramirez’s Amanacer. Integrating Siqueiros’ influence, Aranda emulates “perspective” and “foreshortening.” In the San Diego Union’s 12/7/1970 article, Aranda stated “Ramirez worked 12 hours a day” on Amanacer. Moved by Ramirez’s dedication, Aranda worked on La Dualidad daily from six to 20 hours in 1970 to 1975. Aranda told his sister, Maria “Lolie” Aranda, that he recalls waking up on the scaffolding in The Centro after working on La Dualidad all night, paintbrush in hand. Simultaneously, “Yermo” Aranda was organizing for Mexican youth organizations (he is co-founder of the Mexican American Youth Association [MAYA] along with Johnny “Juan” Lopez at SD City College), Aranda was also involved with protests and other activist endeavors. A handful of times, Ramirez checked in on his protégé, Aranda, who was absorbed in painting La Dualidad. Aranda and one of his assistants, Ernesto “Neto” Paul, recall guys joking with Ramirez, “If you were an apprentice to Siqueiros, then what are you doing here (in San Diego)?” Ramirez, a quiet man, calmly responded in Spanish that he would rather be the head of a mouse than a tail of a lion. 1969-1970, Ramirez’s Amanacer at SDSU’s Aztec Center, assistants Aranda and DeAnda. 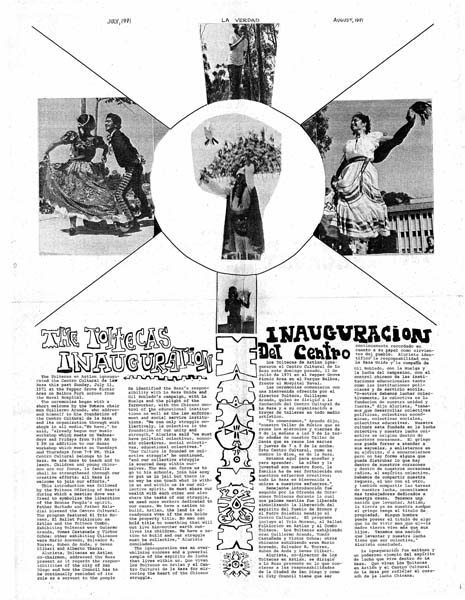 1974 Hijo del Sol, the first pillar at Chicano Park with “Santa Ana Artists,” invited by Aranda. A collaborative design, arranged compositionally by Aranda. 1975 the third and fourth pillars at Chicano Park were given to the “Royal Chicano Air Force” (RCAF) an artist group from Sacramento, assistant by Aranda. This direct link likely broadens the span of influence for Mexican mural art history; the history described here seems to differ from previous documentation. The timeline of events suggests a tangible connection between San Diego, California’s Chicano Park murals spanning back to Mexico’s muralists Gilberto Ramirez and David Alfaro Siqueiros. In 2010, Aranda received a B.A. in integrated studies with a focus on communication design and fine arts from California State University, Monterey Bay (CSUMB). Currently, Aranda shares mural traditions working with elementary students in Northern California and inmates in a California state penitentiary. Maria-Elena Ugalde loves music, words, and creating. She has a bachelor’s degree in psychology and a minor in women studies from SDSU – credentials which support her writing. She was published in La Prensa, “SD’s Introduction to Chicano Mural Art Rededicated at SDSU” on March 14, 2014. She is born and raised in San Diego, CA. She is the niece of Guillermo “Yermo” Aranda. Thank you for this article. I would like to see a plaque with the names of all the “original” artist at the park. I remember the artist at the park and of course Guillermos’ art at SDSU both times the original one and the re-dedication a couple of years ago. Thank you for your comments and your great idea. Thank for also sharing your memories! And thank you very much for your appreciation Maria E. Garcia! I want to extend a warm thank you such an amazing article. It is wonderful to read a article that have factual content. Thank you for sharing your gratitude! My mom, my Tio Yermo, and I were in awe last night upon seeing your last name attached to your beautiful comments, I am still moved. Please also see a sister article in the SD Union-Tribune by Roxana Popescu on Aranda, Ramirez and Siqueiros she lays a foundation that my article stands on. Thank you so much! Please also read Roxana Popescu’s “Muralist celebrates the legacy of San Diego’s Chicano Park” in San Diego Union-Tribune published 4/20/2017. This informative article is outstanding, and our articles compliment eachother. She addresses what I did not and visa versa. Our articles stand side by side, hand in hand, still Popescu creates a base allowing my article to stand on a foundation. Thank you so much Roxana and the San Diego Union-Tribune. I also suggest reading “Looking at Walls, Seeing Murals” by Tobin Vaughn from the NewsCenter at San Diego State University (SDSU), 2/13/2017. David Avalos spoke to me mentioning the outside murals at The Centro were done in 1974. I’m looking into this matter further, thank you. This article is amazing!!! Maria-Elena Ugalde has an amazing skill in writing… Her wording is phenomenal! This article clearly has been successful… From over 350 shares on Facebook, I can tell she has a gift… I think San Diego Free Press should consider making her an editor or something. Thank you nephew, much love!